Demand for healthcare services is growing at a rapid pace. In the U.S., an aging population combined with expanded access to affordable care is already straining our ability to deliver services. Recruiters and HR teams need to act more strategically than ever to find qualified talent, reduce time-to-fill, and stand out in an industry where patient satisfaction is a key differentiator. Learn how you can gain a competitive edge by leveraging a new approach to reference checking. 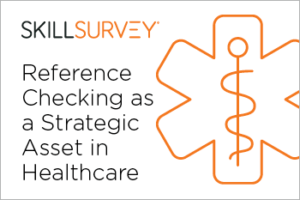 Download our new whitepaper, Transform Reference Checking into a Strategic Asset: Five Ways to Set Your Healthcare Organization Apart and transform your healthcare hiring.